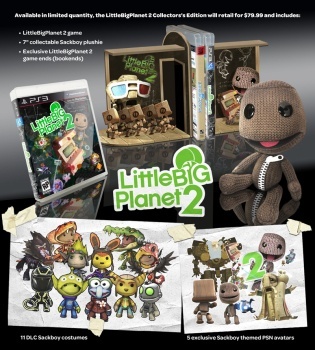 A limited edition package for LittleBigPlanet 2 comes packed with a plush Sackboy and a plethora of other goodies. Celebrating the fact that its latest game, LittleBigPlanet 2, has passed the "alpha" stage, developer Media Molecule has revealed that the platformer will hit stores on November 16th. Arriving one the shelves the same day as the regular version of the game is what, for LittleBigPlanet fans at least, could be one of the most coveted collector's editions to date. The LittleBigPlanet 2 deluxe edition comes packed with a number of collectable items, the most exciting of which is a seven-inch plush version of the series' mascot, Sackboy. Gamers looking to add a little bit of decoration to their shelf of PS3 games might enjoy the massive LittleBigPlanet-themed bookends packed with the set. Purchasers will also be given eleven different in-game costumes, including the alien from Toy Story, Clu from the upcoming TRON: Legacy, the stars of Ratchet & Clank, Jak and Daxter, Gonzo of The Muppets, and four animal costumes. Along with those, purchasers will also receive five exclusive PlayStation Network avatars. For gamers that want LittleBigPlanet 2 but aren't necessarily sold on the box set, a number of the in-game costumes will be available as pre-order incentives from three different retailers. Amazon buyers will receive Ratchet and Clank, Best Buy purchasers get the Toy Story alien, and Gamestop pre-orderers will be given the TRON costume. No matter which retailer you choose, you will also receive an additional four costumes from Even More Animals: a cobra, vulture, mandrill and crocodile. The LittleBigPlanet 2 collector's edition will cost $79.99 and, due to the cost of producing the physical items, will only be released in a limited run. The set is currently only confirmed for the United States, but a comment on Sony's blog promised similar announcements for Europe, Canada, and Latin America. If you are attending the San Diego Comic Con this week and want to take a closer look at the game, Sony will be showing off LittleBigPlanet 2 and giving away t-shirts at its booth.